The very act of gardening is often an act of faith - faith that the seeds we plant will reward us with their beauty and their gifts. At this time in my life when so much has changed, I’m thankful that among my lessons learned are patience, and permission I have given myself to release things truly beyond my control. So, the last time we bought my MIL an orchid, (honestly, I bought one for myself and we needed a hostess gift, so I took one for the team) I went back later and got one for myself. They die, either from benign neglect or too much love. Well, it’s time when it’s time. The arrival of Jesus, long foretold, happened when in due time. Completely irrelevant were anyone’s concerns about scheduling, planning, considerations, etc. (all human follies, not of God). It was time when it was time. Guess what? 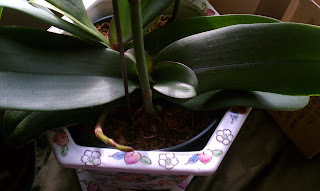 My orchid’s going to bloom. It’s time when it’s time, and to honor that lesson, I’ve started a process that will culminate in Christmas and Kwanzaa gifts, but, as you will see in Today’s Feast, takes time and patience to get right. I’m mastering time and patience, and rather than being frustrated, I’m learning true calm in the process. I am growing, again. And in life, you grow or die. I choose NOT to be like my old orchids, so I’m getting with the program. Grow, baby, grow. Steep, baby, steep. Let the Universe have its way, and for God’s sake, let Him take His Time. Because thankfully, completely irrelevant are anyone’s concerns about scheduling, planning, considerations, etc. (all human follies, not of God). And that’s all the evidence I need today to be reminded that God is Good. 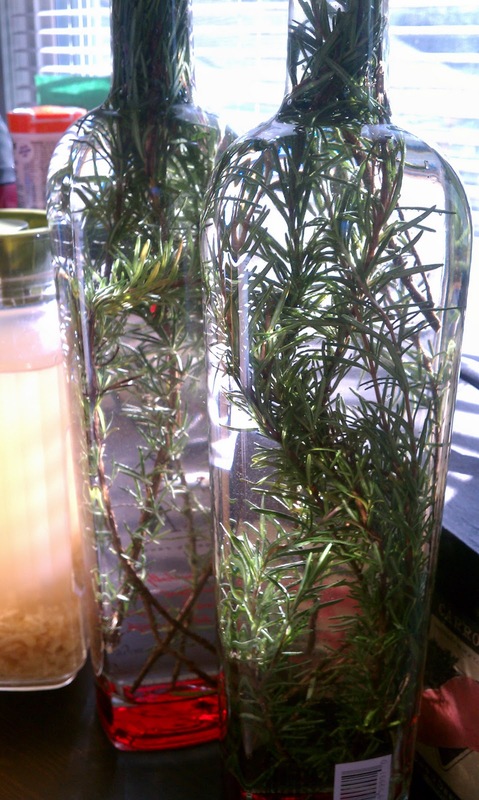 Rinse and dry the rosemary. put as many rosemary springs as you can fit into an empty container and fill with vodka. (Because the Kirkland bottles had space in them, I added about 6-7 long stems including the woody ends. Set aside in a dark place for at least 2 days. Beginning day 3, assuming you can wait that long, taste. Continue to “steep” until you have the desired infusion strength. Strain all of the herbs out of the vodka so it’s nice and clear. Package beautifully (perhaps with a fresh stem of rosemary attached) to give as gifts.